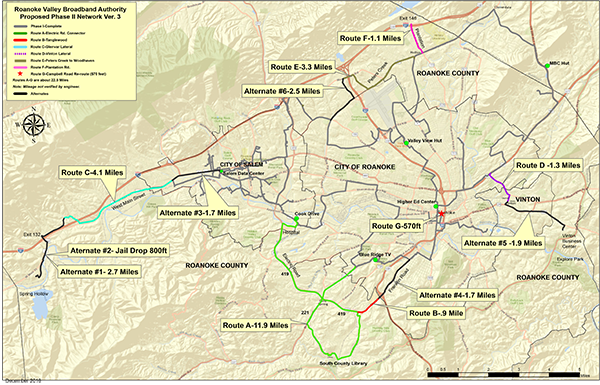 The Roanoke Valley Broadband Authority (RVBA) offers a reliable high-speed fiber option to enterprise businesses, data centers and public sector customers across the Roanoke Valley region. With more than 80 miles of carrier-grade, open-access fiber, RVBA delivers multi-terabit capacity fiber-to-the-door at speeds up to 200 gigabits per second. The system is securely designed with path protection and route diversity through virtual, hardware and physical loop redundancies and U.S. Department of Defense Joint Interoperability Test Command (JITC) certified and APL approved routers and switches. RVBA offers dark fiber (IRUs or lease options available) as well as internet and private transport options up to 200 Gbps. More information is available at www.highspeedroanoke.net.